Spruce up your holiday themed paper crafts and add a hint of nostalgia with a wonderful assortment of lush and festive holly and berry clusters, darling cardinals, as well as an antique candle lit candelabra! 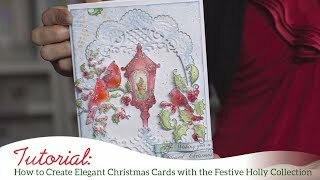 Create layered and dimensional embellishments using these festive illustrations when paired with the coordinating dies, or choose to stamp as accents or main focal points on card fronts or scrapbook layouts! The perfect cling stamp set to add a touch of charm to any Yuletide project! This cling stamp set is part of the Festive Holly Collection and pairs with the Festive Holly & Cardinals Die.